Zanna Clay and I studied bonobos at the Lola Sanctuary in the DR Congo. This sanctuary is unfortunately needed because of all the bushmeat hunting. Many young bonobos lose their mothers to hunters and end up on the market. There they are confiscated and brought to the sanctuary where they grow up. We study these orphaned bonobos and compare them with mother-reared ones -- the bonobos occasionally reproduce at the sanctuary. We were particularly interested in empathy, which we measure the same way it is done in human children, by seeing how they react to the distress of others. 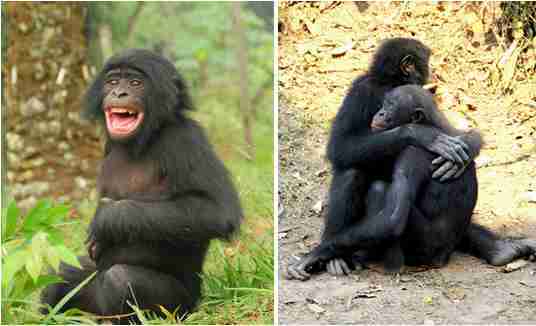 One photograph shows a distressed bonobo (usually after losing a fight or seeing something scary), and another photograph shows the consolation response (calming body contact) indicative of empathy. 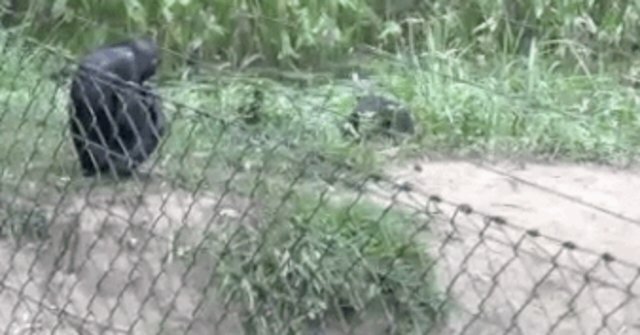 The video shows consolation of one baby bonobo by another after the first was bitten by an adult. The main conclusion from our study is that mother-rearing prepares bonobos emotionally for empathy with others. Orphans have trouble with their own emotions, and as a result do not show concern for the distress of others. If emotions are not well-regulated, bonobos have the same problems with empathy as human orphans. Or, to put it more positively, having a loving mother helps young apes develop a caring attitude themselves.